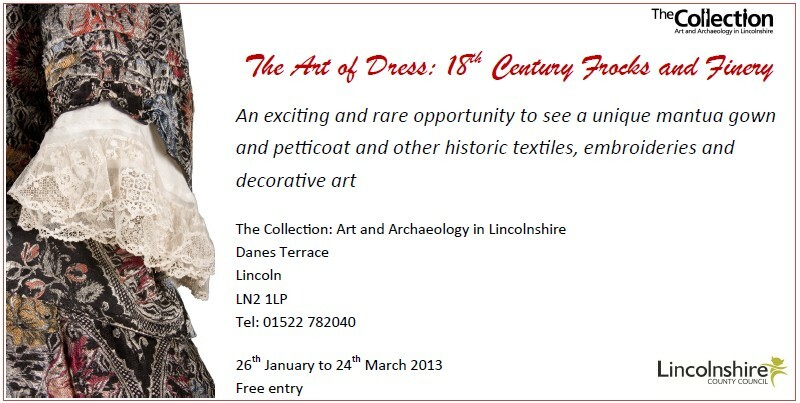 The Collection is hosting an exhibition of18th Century clothes and other finery from 26th January to 24th March 2013. The centre piece of the exhibition is a rare black mantua gown and petticoat, that has managed to survive almost 300 years. Experts are perplexed on how it's managed to survive in such excellent condition, as dying silk black in those days was exceedingly destructive and the gown should have rotted to nothing years ago! Please go visit the exhibition, entry is free. 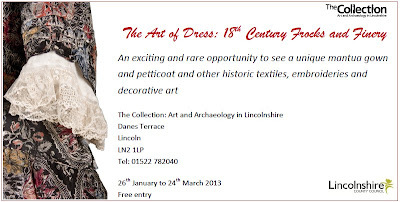 Also, Sheila Landi of the Landi Company Ltd who did the preservation work on the gown and restored it to its original 1735 design will be giving a talk on the work carried out on 7th February starting at 2:30 pm. Tickets are £6.00 and available from The Collection. Tel: 01522 782040 for more information. Pauline’s free-machine stitched textiles are very painterly with good compositions yet loose and flowing. Her slides of her other work was a complement to the hands-on, tactileness of the exquisite textile pictures she passed around. Pauline also shared a selection of her sketchbooks, from each evolving 'phase'. Her family connection to the lush and colourful Jamaica gave her a background to understanding of the African mythology/folktales from her reading (and reading to us); these were often featured in her painted-with-thread pictures. She explained that to sew afro-hair needed an acceptance of breaking sewing machine needles. Pauline currently delights in sharing her expertise as art practitioner in the mental health sphere. There were five of us on Saturday free machining our way towards a leaf and butterfly ensemble. It was a relaxed day and so absorbing that three o'clock surprised us. We had a lovely day with Carole Biggin on Saturday 17th November. In Carole's workshop the children were bonding, layering, stitching and beading, creating a fabric which was then cut and rearranged to create wonderful 3D decorations and seasonal cards. Both hand and machine embroidery was used in their work. Pauline will be talking with reference to her work - both large and small, framed and unframed wallpieces illustrating contemporary and ancient poems and myths by black writers. She uses hand and machine embroidery using silks, fleecy cottons, muslins, organzas, semi-precious stones, shells and coins. Angie set us up with black velvet, foils and sheer ready for a day of machining towards a bejewelled bag. To begin with we learnt how to use foils on velvet with bondaweb and each of us patterned our black velvet with fabric and foils. Over this went the sheer and the machining started in ernest. We learnt how to finish off our bags at home. She put together a kit for us to make her Elizabethan scissors case, part of a chaterlaine. The central aspect of this work was to learn detatched button hole stitch. Certainly this stitch puts all the expensive thread on show on the front of piece with very little on the back. You will need some inspiration, I have used Klimt as a starting point because his work is easy to find pattern in. I have a few books and photocopies but if you have any books yourselves this would be helpful. ....with free machine embroidery foot or darning foot. Black cord 2mtrs long for closure and handle. 10am - 4 pm free admission Saturday 29 September. Tea, coffee, scones and home made cake. Make time also to see 1000 years of craft in Lincoln Cathedral, Bail and the Castle. The Y E group met on Saturday 15th September, with a lovely day making Fabric Wallets. The children had to cut out their fabrics, using paper patterns, which were then hand embellished with ribbons, lace and embroidery stitches. In the final step, the wallets were assembled and sewn together using the sewing machines. Some children added a fabric purse to the wallet. So a busy day was had by all. Lincoln Bailgate member,Kathy Paton took inspiration from the safety pin bracelet stitch club in July. Marion Barnett spoke to Lincoln Bailgate in July 12. She succeeded in demystifying Lutrador, Evalon and Zeelon( we love Zeelon) and showed us results of her very creative colour and layering techniques.